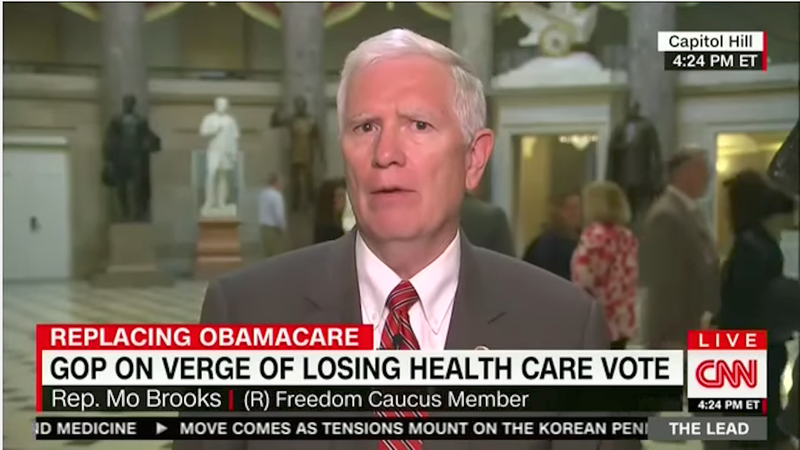 On Monday, Alabama Rep. Mo Brooks joined Jake Tapper on CNN to promote “Trumpcare,” the new proposed replacement for the Affordable Care Act. And in so doing, he touted one aspect of the plan in candidly selfish terms: those who are healthy will no longer be burdened by the medical needs of the sick. As the Daily Intelligencer notes, Republicans generally cushion their Randian health care perspectives in euphemisms like “choice” or “patient-centric”—or they emphasize the value of “competition.” Brooks doesn’t bother with that approach. As far as he is concerned, sick folks have fucked up their own lives, and that’s not his problem. Of course, Brooks’s reference to a good, healthy life heaves under the weight of his assumptions—that these morally upstanding folks can afford health care and nutritious food and robust shelter. It’s easy to make wholesome lifestyle choices when you live ten minutes from a Whole Foods, rather than in the midst of a food desert, and when you’re not sleep-deprived from working multiple jobs. Impoverished families are far more likely to be faced with medical emergencies, and they’re the ones who generally cannot afford the necessary treatments. If we follow Brooks’s logic, we land in grotesque but familiar territory, at least where the GOP is concerned. Those with wealth deserve it, and those without it deserve their poverty. And if that poverty results in a grievous medical condition, well, you’re to blame for that as well. Watch Brooks’s remarks in the video clip below.